Your agent’s silent a minute and you can hear him shuffling some papers on his desk. 10 Stuart Broads? What you going to with them? This re-make of Twins is going to be terrible. What you going to with them? A Stuart Broad fancy dress party? This re-make of only fools and horses is going to be terrible. Erasure are looking rough these days. Hmmmm, what to do with 10 Stuart Broads? I can’t decide between putting 5 of them in our ODI top 6 batting line-up or just strategically placing all 10 around Old Trafford, each holding a corner of a large tarpaulin to shelter the pitch from rain. Get your ‘ands out of your pockets you ‘orrible little man!! Yes, Stuart, put your hands on your chin, in a thinking-woman’s cricketer pose. I like to think of myself as a thinking-woman, however, under no circumstances does this make Matt Prior my type of cricketer. It his pose, not himself as an individual. He’s posing as a thinking-woman’s cricketer. I could pose as a super-model, or Admiral Adama, it doesn’t make me either. He’s clearly not pulling off the pose. Maybe he should go for Broad’s more truncheon-juggling look. If you were Admiral Adama you wouldn’t need to do a special pose. Just the fact that you’re in charge of a giant spaceship would be enough to impress the girls – thinking or otherwise. Matt Prior should go for a pose that involves a bag over his head. That would work for him. Why do the belts have a picture of fallopian tubes on them? Apologies as seem to have given the Broad clones v bad dandruff. You won’t be getting preggers in a hurry, miriam. Lemon Bella you have just given me enormous hope. I always assumed Battlestar Galactica and being attractive to women was mutually exclusive! I really hate Matt Prior, and I thought that before I saw this picture. 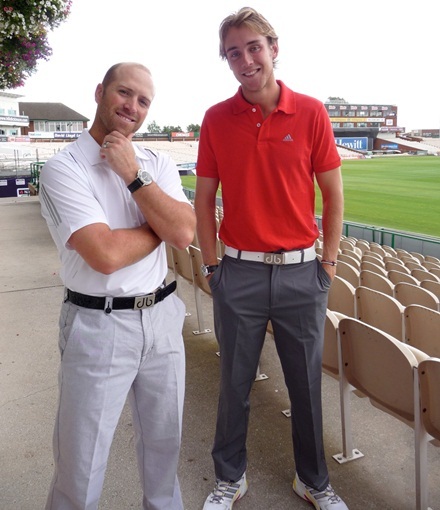 Stuart Broad is wearing my primary school’s uniform. Except for that belt, which would be unnacceptable and result in a trip to the principal’s office. Thank you Ceci. I am terrified by the No.14 Cylon who are clearly a Stuart-Broad-modelling-belt model. And i always hoped it’d be my girlfriend. It would have explained more. Ok, a picture of upside-down fallopian tubes. Oh, I’d quite forgotten how brilliant this was. “I just love the colours”? Colours shown; black, white. Whoa there. Right Said Fred have let themselves go. I thought about going with Eurythmics, or the Pet Shop Boys. I still feel there’s a better alternative out there. But I’m not going to get upset about it. You do realise that further up the page we’ve written: “Erasure are looking rough these days”? Yeah. That was in the past though, so it doesn’t count. The best official cricket songs in the world… ever!